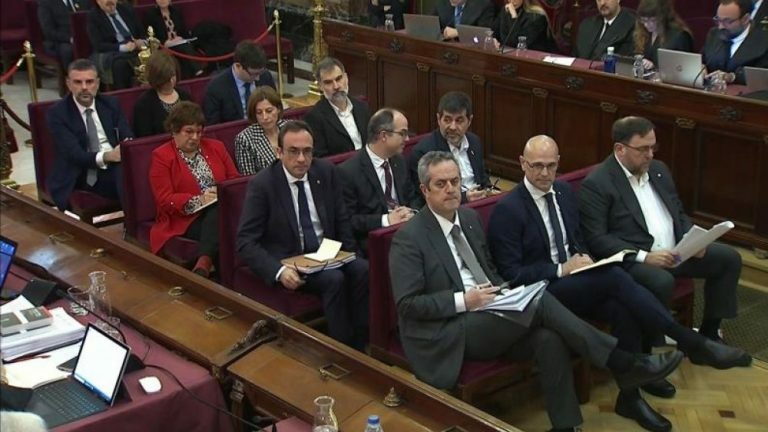 In the three sessions that made up the sixth week of the trial, we heard the witness statements of 24 agents of the Guardia Civil who made entries and searches in various locations and who drew up the police reports that recounted the facts they witnessed, and the analysis of the documentation seized. The consequence of these statements is simply devastating, both in terms of the existence of embezzlement and the violence that is part of the crime of rebellion, as opposed to the crime of sedition. With regards to the crime of embezzlement, although we will not dwell on the analysis of each of the payments and contracts that constitute the indictment, it is necessary to highlight the statement of Felipe Martinez Rico, then Undersecretary of Finance, who opened wide the doors to the crime by clearly stating that the damage against the Public Treasury is not created at the moment of the payment, but before, when the debt is generated. On the other hand, in relation to the crime of rebellion, the testimonies of the civil guards about the violence were really chilling; all the more so if we consider that they are officials used to experiencing tense situations. In addition to describing how they were insulted and spat on, they described serious incidents of tension («the crowd gathered in such a way that they wanted to remove the detainee from the security capsule… something unheard of. They grabbed him by the neck, they grabbed him by the clothes, they tried to take him away from us, the civil guards that were escorting him»). Thus, not only did they assure that «everyone had their hearts on their mouths», but some even broke their voices when they recounted that in all their professional life they had never seen so much hatred in people’s eyes, and only because they were doing their job. On the other hand, after twenty sessions of the trial have been held, we can consider that the decision of the Supreme Court to stream it live has been a very good call. Thus, although it was adopted with the aim of showing the greatest possible transparency, the reality is that it is also allowing us to appreciate, at a glance, if the allegations of the defenses on violation of their rights of defense have any ground. These allegations are based on the limitation of the questioning of witnesses to the strict scope defined by the party that proposed them, and due to the decision to not show the videos of September 20 and 21 and of October 1 at the same time as the questioning of the Civil Guards who participated in those events was carried out. And the answer in both cases is no. If one sees the live streaming, the references and citations from constitutional and international law principles on the violation of the right to defence made in legalese seem empty in front of the normality of the interrogation and the needlessness of watching a cropped part of it. For example, from the September 20 siege at the Regional Ministry of Economy, when the witness is testifying about what he saw or perceived. Perhaps this is why the defences have already sent at least four complaints addressed to the Court protesting the alleged violations of their rights. Why do they do this if they have already done so loudly during the trial and there is a visual record of it all, being therefore, for legal purposes an unnecessary reiteration? Because a well drafted document in legal language with wide international citations permits the creation of a parallel reality to the one that is taking place at the trial and allows to spread it to the national and international media, in spite of the fact that it is clear that its content lacks any foundation simply by checking the recorded video. And this attempt to create a parallel written trial was referred to precisely this week by the President of the Chamber. At the same time, it is interesting to see how the defences, while alleging infringement of defence rights, try to prevent witnesses from verbalising certain facts of which they have become aware by reading or listening later to recorded conversations. We have been able to see this this week with regard to an arrested top Catalan official, who ordered his secretary by telephone to throw out from the balcony all the papers that were on a table before the arrival of the Guardia Civil. The defense protested because such conversation was already recorded in the documentary evidence and it was not necessary for the witness to verbalize them; and why? Because a transcribed conversation is not the same as an allegation broadcasted in streaming before the general public. In short, as we say, a very good decision that will surely help in subsequent challenges before international courts.